From the west: take I-24 eastbound through Chattanooga, cross Missionary Ridge, take exit 184 (Moore Rd. ), turn left. From the east: take I-24 westbound, take exit 184 (S. Moore Rd. - first exit past I-24/75 intersection), turn right. From the south: Take I-75 northbound from Atlanta, turn westbound on I-24, exit at Moore Rd ( first exit past I-24/75 intersection), turn right. Drive north on S. Moore Road to Brainerd Road (first traffic light). 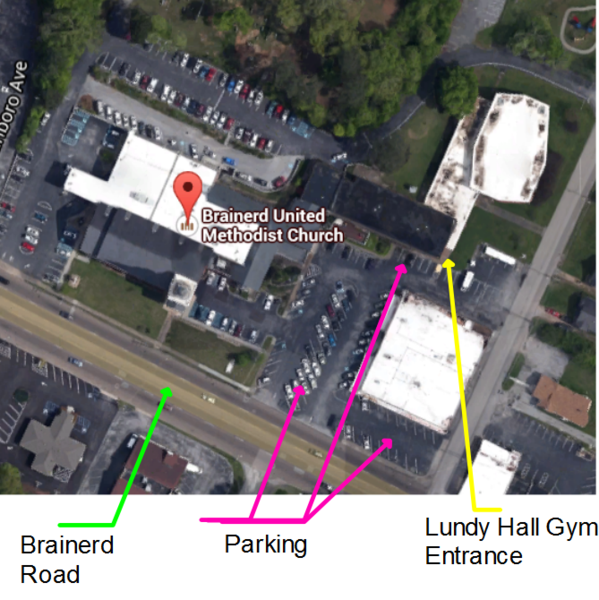 Turn left on Brainerd Road, United Methodist Church is 1/2 mile (first church) on right. Lundy Hall is on the right side of the church complex.